I wrote about Jeremy Gregory previously in Clocks Magazine in April 2007 but as new information comes to light it seems to me worth writing about him again. He was born in 1621, the son of Edward Gregory of St. Dunstan's in the West, London. Edward was a spectacle maker and a member of the Goldsmith's Company, apprenticed in 1597 to James Dehammel and freed in 1606. Jeremy was apprenticed in 1638 in the Goldsmiths' Company to Jeremy East, brother of Edward East, for whom he may have worked in his earlier years and by whom he was much influenced in his work. This view is strengthened by the fact that the output recorded in his own name is very small, far too small for a man producing work for over forty years. He was freed in the Goldsmiths' Company by patrimony in 1647, in which year he took Henry Mason as apprentice. However he was already working by 1646 and was 'accepted' by the Clockmakers' Company and took apprentices through them, perhaps because of his close connection with the powerful East family, and this despite he fact that his freedom there is not recorded, perhaps by some oversight, till he was made a Free Brother in 1652. He married twice, firstly on the 23rd November 1647 at St. Ann's Blackfriars to Elizabeth Grissill (or Griffin? ), by whom he had several children, mostly baptised at St. Michael's Cornhill, being: 1648 Elizabeth (died 1656); 1649 Rebecca (married in 1670 to Richard Haddock); 1651 Hannah (died); Thomas (died 1655); 1655 Hannah; 1657 Elizabeth (died 1657); 8th September 1658 Jeremy; 1660 Elizabeth; 1660 Ann (married 1680 to Brian Bentham). His son, Jeremy, was not Jeremy Gregory(II), the clockmaker, but was married to Mary Gregory, the daughter of Sir Edward Gregory, of Chatham shipyard fame. His wife, Elizabeth, was buried in St. Giles's Cripplegate on the 6th September 1667, having died rather horribly of gangrene! He was married secondly in 1669 by a Vicar General's marriage licence to Susanna, nee Reynolds, believed to have been the widow of goldsmith Robert Hancock, whom she had married in 1664. Rebecca his eldest daughter was married in 1670 to clockmaker Richard Halstead, and after his untimely death married again (in 1678) to clockmaker Richard Jarratt, who also died young and in poverty. He was at one time known as Captain Gregory, later still as Major Gregory - presumably serving in the Royalist army. A man who worked for and with Edward East (a wealthy and powerful man with Court connections, who later became Clockmaker to the King) could hardly have fought for Cromwell. He took at least fifteen apprentices from 1647 onwards, mostly through the Clockmakers' Company, but his first one was also bound through his official Company, the Goldsmiths. He was Closely connected with Robert Grinkin in whose will of 1660 he is mentioned as a 'very loving friend'. He was also connected with Simon Bartram in whose will of 1665 he is described as a 'loving friend' and executor. In 1670 he was one of the four appraisers of the inventory of Benjamin Hill, q.v. In October 1655 he employed Jacob Renon a foreigner as journeyman, and also illicitly employed at the same time Jacques Patte from Geneva as journeyman (in collusion with Grinkin and Bartram). 1. This full-sized clock was built originally with a verge pendulum swinging between the going and striking trains, a feature of many lantern clocks made when the pendulum was first introduced. It was discovered in the United States of America. Jeremy Gregory was one of a group, who were often complained against by several Company freemen for illicitly employing foreigners, the very problem the Company had been formed to prevent. These dissatisfactions against certain of the Company administration culminated in 1656 in a petition to the Lord Mayor by thirty three complainants. A counter-petition was presented from those complained against, in other words by what might seem to be the 'loyal' members of the Company, of which Gregory was one. In fact the Company administration had rotated the senior offices of the Company exclusively amongst themselves in a most shameful manner for about ten years past and in1656 Gregory was an office holder himself, as Assistant. Those administrators included Edward East, Robert Grinkin, Simon Bartram, and Benjamin Hill. But nothing changed and Gregory himself became a Clockmakers' Company Assistant from 1656, Warden from 1660, Master from 1665 to 1668 and again in 1676. Even after the 'rebellion' he was frequently complained about by several Freemen of the Clockmakers' Company for employing foreigners, being 'abused' for this in 1657 by Thomas Weeks. In 1668 he was attacked verbally by John Nicasius, a man notoriously short on temper and long in his choice of Anglo-Saxon epithets, for which the Company tried to make allowances 'considering his usual temper too well known to all persons of the Court'. In 1685 Daniel Beckman berated him, accusing him of employing a Frenchman (Jeremy Gazuet). It does rather seem as if some members of the Goldsmiths' Company regarded themselves as above the general rules of the Clockmakers' Company, and Gregory was one such. He worked in Cornhill in 1662, in 1663 was a 'watchmaker near the Castle Tavern in Cornhill'. In 1664/65 he gave as bondsmen his uncle Mr. Thomas Waplett and his brother-in-law Mr. Samuel Lloyd of Shrewsbury, draper. It was this bachelor uncle, Thomas Whaplett, who died in 1679 leaving Jeremy a massive bequest of property. In 1678 he advertised for the whereabouts of Nestor Helme his 18 year old run-away apprentice. In the London Gazette for the 24th January 1680 was a notice regarding stolen property offering a reward if notice given to Widow Lowis 'or to Mr. Gregory, Watchmaker over against the Royal-Exchange in Cornhill'. He last attended Company meetings in 1685 and died in 1686 and was buried at St. Michael's Cornhill on the 4th June, a very wealthy man. His possessions included a clock made of gold and a 'picture in gold set in diamonds'. He had connections with Sunninghill, Berkshire, where his second wife had owned property. In 1698 a watch by him was raffled by clockmaker Andrew Brown of Edinburgh. He was not the father of a second clockmaker named Jeremiah Gregory, who is believed to have been his nephew and who was apprenticed after he had died and was working from 1694. 2. The beautifully-engraved dial centre spells Gregorie eccentrically with ie as it does Jeremie. If we summarise his work the most apparent fact is that very few clocks or watches by him are known. In the autumn of 1977 when Ronald Lee advertised for sale a bracket clock by him in Antiquarian Horology, he pointed out the scarcity of his work, in that at that time only one other bracket clock was known by him. This was one with a Royal connection in the form of a mount with the Royal Cypher of Charles II (then in the Victoria and Albert museum and said to show in it the influence of Edward East). Additionally Lee counted up three watches, one longcase clock and one lantern clock. Since then only four lantern clocks have come onto the market, three of which I have owned. Whether the lantern clock Lee noted in 1997 was one of these I cannot say as we have no details of it, but the scarcity of Gregory's work is only emphasised all the more when we have to even ask ourselves whether or not to add one more to his total known number of four lantern clocks. The position is complicated because two of the four clocks were sold twice in that time. For the last forty years or so I have tried to keep a photographic record of such things so that I can determine whether a clock coming to the market is one that has been recorded earlier and is re-appearing, sometimes with alterations. The gist is that four lantern clocks are known by him. Of his lantern clocks one is signed 'Jeremie Gregory Neare the Royall Exchange London', another 'Jeremie Gregorie at the Royall Exchange', another 'Ieremie Gregory at ye Royall Exchange' and the miniature is signed 'Jerimie Gregorie at ye Royall Exchange'. Four different clocks each with a variation of the spelling of the name or address or both! Gregory signed his clocks, or his engraver did, in varying ways with varying spellings, even of his own name. I have commented on this factor before, whereby clockmakers of the seventeenth century seemed completely unconcerned as to how the engravers spelled anything, including even the makers' own names. Two were made (originally) with balance wheel control and two with verge pendulum. There is no apparent difference in style in the clocks, other perhaps than that one is signed on the fret, the other three in the upper dial centre. Just recently a correspondent sent me a photograph of the eight-inch dial of a clock, being all that survives of what was probably a longcase clock by him and signed in a previously unrecorded way: 'Jeremie Gregory at Gresham Coledg Londini'. 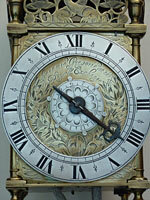 Another longcase clock has also been noted recently. In summary we have a total known output of three watches, two bracket clocks, three longcase clocks (if we include a surviving dial) and four lantern clocks, and this from a man who was in business for forty years! Alongside that there are several clockmakers contemporary with him by whom many works are recorded. He hardly seems to have been exerting himself. So why is that? What was Gregory doing for forty years or so? And what use had he for fifteen apprentices and the several journeyman he kept employing. This very small output in his own name can be explained in several possible ways. Perhaps he and his apprentices and journeyman worked for many years for the business empire of Edward East, with whom we know he was closely allied. Although he was working from 1646 none of his surviving work seems to date from anything like this early period. Nothing seems to exist by him from the 1640s, 1650s, or perhaps even the early 1660s. His lantern clocks would seem to date from the 1670s, his pendulum ones from the late 1670s at the earliest. This absence of work from his earliest periods would be consistent with his working for the East concern. But also it seems that for most of his life he was a man of some wealth having had several bequests and having twice married well. This could mean he had no need to work. It is doubtful whether he worked after 1679, when he received a property bequest from Thomas Whaplett. Whatever the reason his work is rarely seen today and this seems a good opportunity to put his lantern clocks on record.